Retired September 30, 1971. Died July 15, 1981. Major General Robert H. McCutcheon was the commander of the Ogden Air Materiel Area, Hill Air Force Base, Utah. 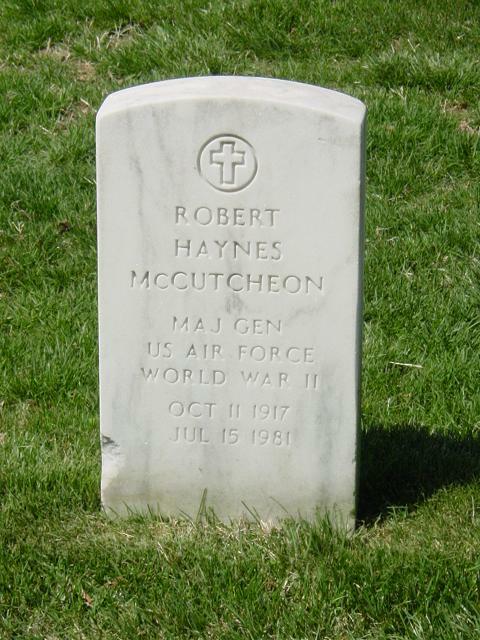 General McCutcheon was born in Damascus, Virginia, in 1917. He graduated from Berea College, Berea, Kentucky, with a bachelor of arts degree in 1939 and entered the Army Air Corps as an aviation cadet in June of that year. In March 1940 he received his pilot wings and commission as a reserve second lieutenant at Kelly Field, Texas. He received his regular commission through a competitive examination in 1941. His first assignment was to Mitchel Field, New York, with the 18th Reconnaissance Squadron. He remained with this squadron as pilot and flight leader during successive moves to Langley Field, Virginia, Muroc Lake, California, and combat in New Guinea. In October 1942 he was named commander of the 71st Bombardment Squadron, and in 1943 after leading his squadron in the battle of the Bismarck Sea, he became operations officer for the 38th Bombardment Group. He returned to the United States in late 1943 and served as operations officer for a B-26 operational training group before being assigned to Headquarters Army Air Forces in the field office of the air inspector. He entered the Harvard Graduate School of Business Administration in 1947, achieved the rating of Baker scholar, and graduated with high distinction in June 1949 with a master of business administration degree. Following a year's training with industry, he served from 1950-1955 at Headquarters Air Materiel Command, Wright-Patterson Air Force Base, Ohio, as chief, Plans and Programs Office; chief, Guided Missiles Division; chief, Weapon Systems Division; and then as executive to the director of procurement and production. The general then served as commander of the Air Materiel Command base in Sevilla, Spain, until October 1956 when he was assigned to Wiesbaden, Germany where he served as director of procurement and production, director of materiel and then deputy commander of the Air Materiel Force in Europe. General McCutcheon returned to the United States in 1958 to attend the Industrial College of the Armed Forces and was assigned to Headquarters U.S. Air Force in June 1959. Following an eight months assignment in the Office of the Director of Programs he moved to the Office of the Secretary of Defense. In 1962 he was made director for procurement policy in the Office of the Assistant Secretary of Defense, Installations and Logistics. In July 1965 General McCutcheon became the director of procurement and production, Headquarters Air Force Logistics Command, Wright-Patterson Air Force Base, Ohio, and served in that capacity until Dec. 15, 1967, when he was assigned as commander, Ogden Air Materiel Area. His military decorations include the Legion of Merit with two oak leaf clusters, Air Medal, Army Commendation Medal with oak leaf cluster and the Distinguished Unit Citation.